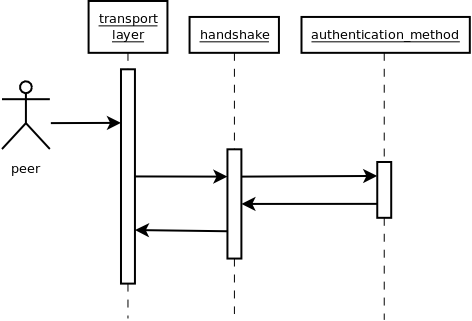 The GnuTLS handshake protocol is implemented as a state machine that waits for input or returns immediately when the non-blocking transport layer functions are used. The main idea is shown in Figure 10.2. Figure 10.2: GnuTLS handshake state machine. Also the way the input is processed varies per ciphersuite. Several implementations of the internal handlers are available and gnutls_handshake only multiplexes the input to the appropriate handler. For example a PSK ciphersuite has a different implementation of the process_client_key_exchange than a certificate ciphersuite. We illustrate the idea in Figure 10.3. Figure 10.3: GnuTLS handshake process sequence.